The smaller slide-out is lighter in weight and presents less structural challenges compared to a longer and heavier slide room. On balance, you don’t get the wide-open feel of the full-wall slide, which might be a deal breaker for some. 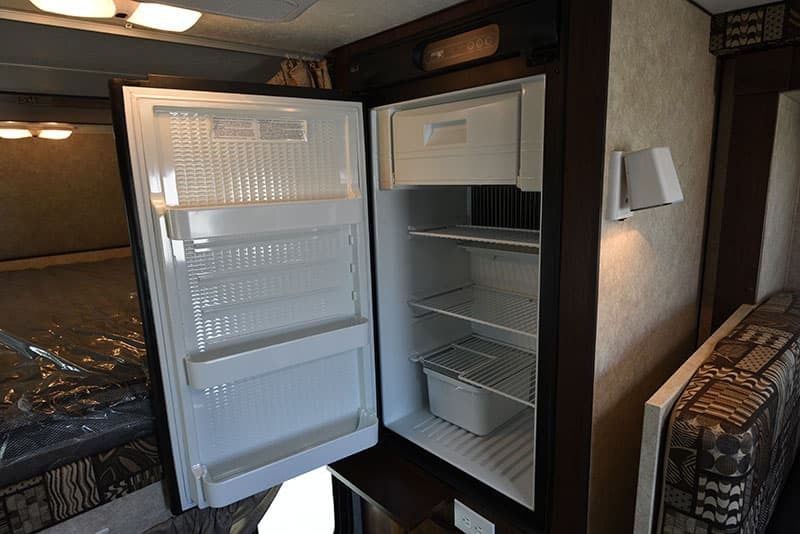 The Norcold 5-cubic foot refrigerator is a good size for this 8’6” camper. Some might prefer a 6-cubic foot refrigerator with a directly accessible freezer door, but this refrigerator offers a useful amount of storage and takes up less weight and space than its 6-cubic foot cousin. Under the refrigerator is a slide-out counter extension, 110-volt outlet, and a compartment. All of these features would go away if they switched to a 6-cubic foot refrigerator. Which would you prefer? 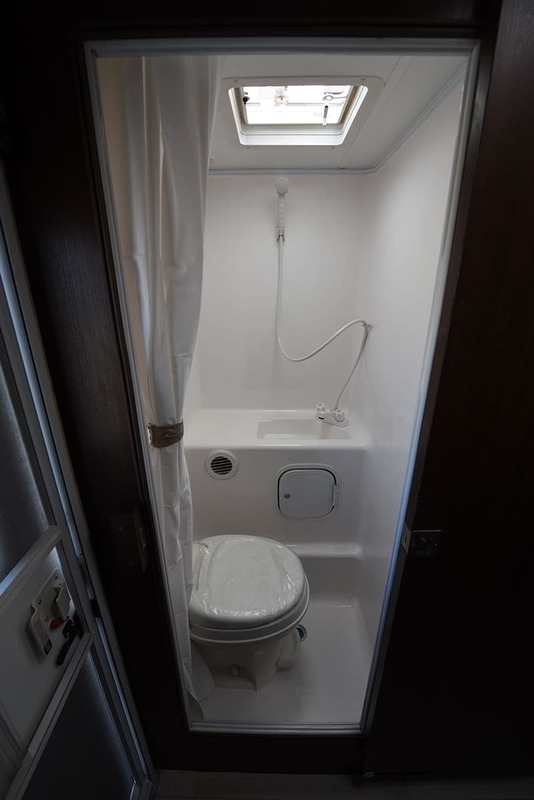 Directly across from the cabover is the wet bath. The Rugged Mountain wet bath is a high-quality one-piece molded fiberglass design with a flush-toilet, sink, shower, light, and fan. There’s even ducted heat into the bathroom, but it’s pointed right at the person sitting on the throne. Talk about a hot seat. 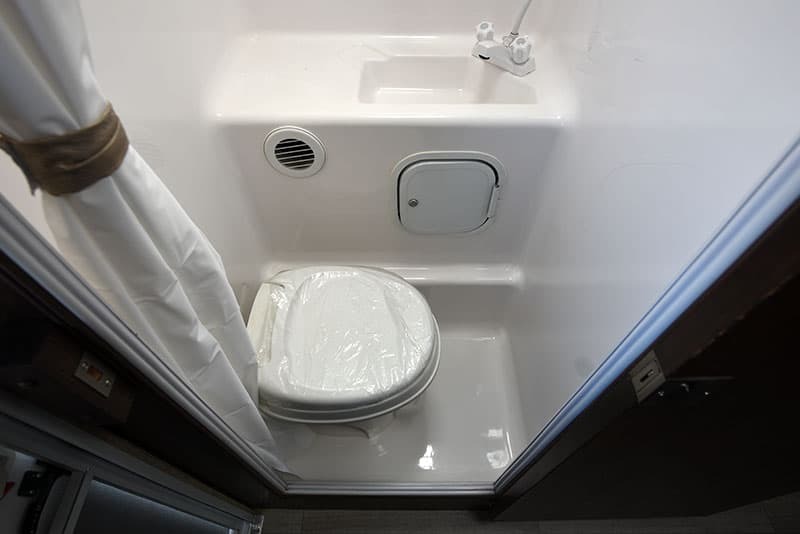 Leg room is a bit tight here so I recommend sitting on the toilet to make sure it’s comfortable before purchasing the camper. Too many folks forget or are too embarrassed to sit on the toilet and stand in the shower at a dealership. For goodness sake, have a seat. This isn’t something you want to discover after the purchase. Unless you’re over 6-feet tall, this toilet and stall should be just fine. The quality of the fiberglass stall is top notch. The only thing in the bathroom I didn’t quite get was a the lock on the toilet paper door. Talk about a mean trick to play on your spouse. No potty paper for you! Look at all the storage. Yes, the counter space isn’t exactly gourmet heaven, but there’s enough to get the meal prep and dish washing done. Overall, this is a nice old-school kitchen design. Very functional and attractive. This is one of those meal prep or dish washing counter spaces. If the range oven is closed, there’s plenty of surface area for washing dishes. If the range oven is open for cooking, meal prep space is tight. That is if you’re unaware of the countertop trick the Rugged Mountain has tucked under the refrigerator. Under the sink is a pull-out counter extension that pulls across to meet the kitchen counter. Neat trick! 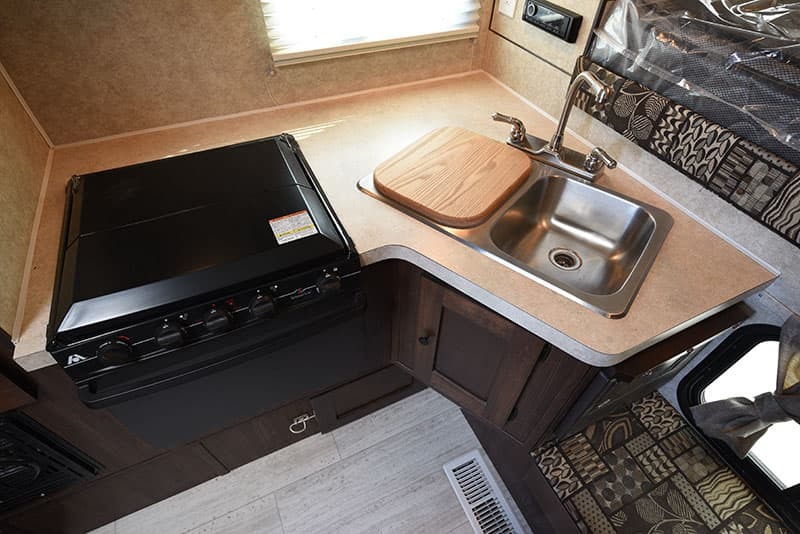 This is something we haven’t seen in any other truck camper. Very clever, and useful. 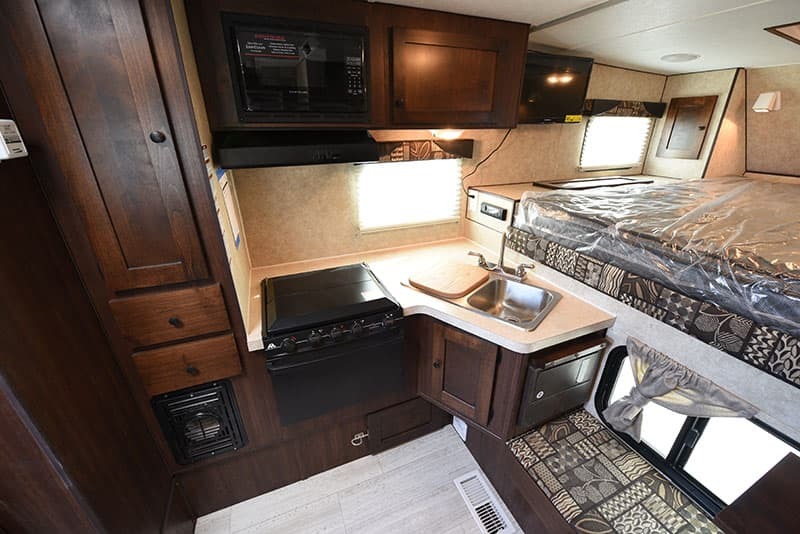 The cabover continues the themes; old-school layout, lots of storage, and clever touches. I was bowled over by the quality of the mattress. 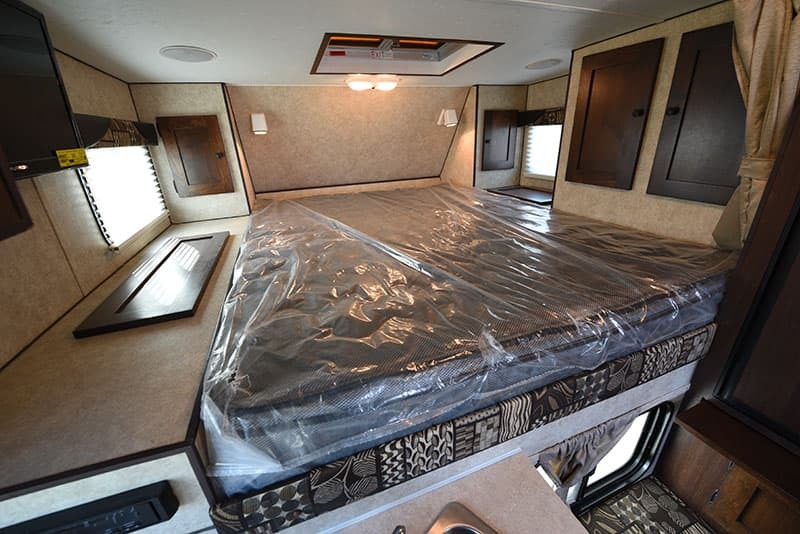 This might be the best standard mattress I’ve ever seen in a truck camper. When crawling up to turn the reading lights on, I darn near took a nap. Between you and me, maybe I did. No one was there. And I am the Publisher of this magazine, right? I can nap when and where I want to. Just don’t tell Angela, or Harley for that matter. 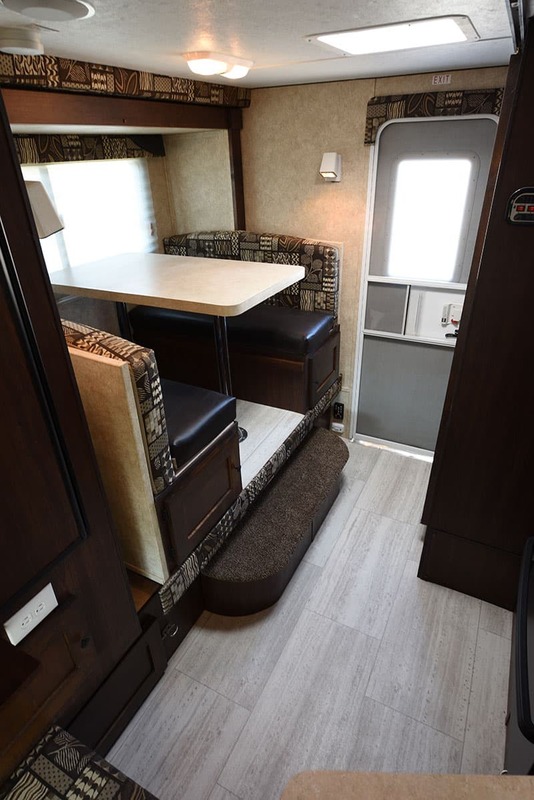 Turning from the cabover and looking back towards the entry way, I was impressed at how much floor space this camper offered. 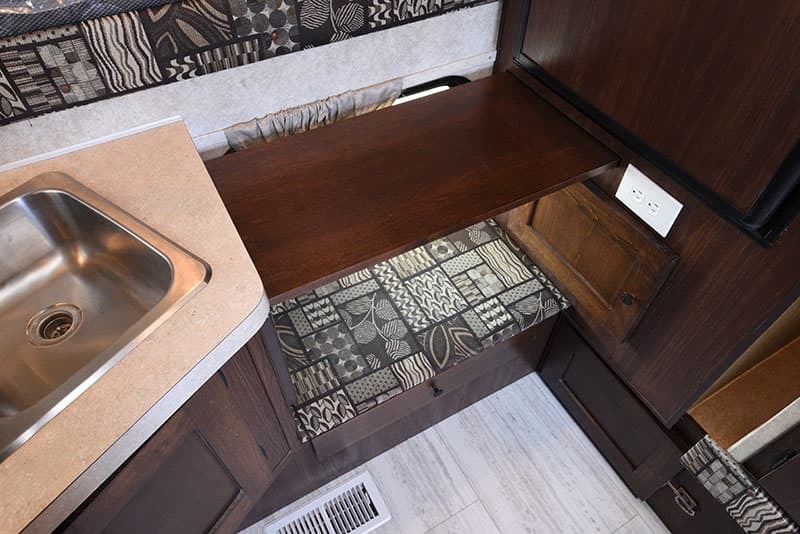 In this photograph you can see why dinette slide-outs were such a hit when they launched about 20 years ago.